The root of genus “solidago” comes from the Latin “solidare” which means “to make whole”. Goldenrod earned this name for its traditional use as a vulnerary, an application which has fallen out of use in modern herbalism. In Germany, it is referred to as the “fastening herb”, and in ancient times, they’d gather it before battle to have on hand for treating wounds. This German traditional use of the plant is still be found today in the Pennsylvania Dutch community. “Wundgraut” is infused in oil or made into a liniment for muscle strains in much the same way arnica is used. The plant’s tannins give it an astringent action which support the stanching of blood flow and closing wounds. It seems this plant has the ability to make whole a variety of conditions and complaints. Native Americans chewed the leaves for sore throats and the roots for toothaches. They used the herb to treat headaches, stomach ulcers and spasms, and saddle sores on their horses. The seeds were also used as a food source. Goldenrod was also used to relieve cramping, and as a general anti-inflammatory. Gastrointestinal gas and bloating were also relieved with a tea of this plant. A traditional name for it in the Appalachian mountains is Blue Mountain tea, and it was a favorite remedy for fatigue and exhaustion. After the Boston Tea Party, colonists had to look to native plants from which to make their tea, and sweet goldenrod was one of them, along with red clover, chamomile, roses, and violet. 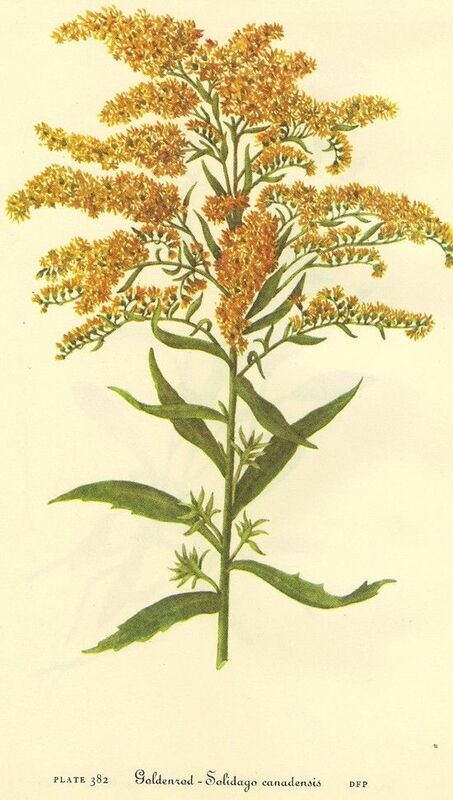 Colonists also used goldenrod as a dye plant, and believed that it brought good fortune when it grows near a house. The strong but flexible central stem was sometimes used as a divining rod for “water witching”. Goldenrod is a natural source of rubber, and Thomas Edison actually bred a 12 foot tall goldenrod to yield a higher rubber content than the native variety. Henry Ford gave Edison a Model T with tires made from goldenrod rubber. There are around 130 species of goldenrod. It can be found growing in sandy, rocky soil on the edge of a lake, or in moist, rich soil along drainage ditches, roadsides, and meadows. Solidago species are native to the Americas, Europe, and Asia. There are few places in the world that do not have some species of goldenrod growing nearby. Some species are cultivated as a garden plant in Europe. They are an herbaceous perennial, spreading by rhizome to form clonal stands. In some parts of the world, it is considered an invasive species. It has lanceolate leaves that get progressively smaller as they go up the stem, and once the larva hatch they start eating the stem from the inside out. An enzyme in their saliva forms a gall on the stem of the plant, where they will live for more than a year before emerging. These galls are desirable for their higher content of tannins, which have an astringent effect. There are many species of goldenrod, all of which can be used interchangeably for medicinal purposes. S. canadensis, S. odora, and S. vigaurea are the most commonly used in herbal medicine. It is mostly used in practice today for seasonal and cat dander allergies, where mucous membranes are atonic with copious dripping, sore throat, and the typical red, inflamed conjunctiva. Goldenrod often gets blamed for ragweed allergies, but what little pollen it does produce is too heavy and sticky to be airborne. Ragweed, which blooms at the same time, produces large quantities of very fine pollen that travels easily on the wind. Even though they bloom simultaneously, goldenrod is much more conspicuous with its bright yellow inflorescence, which is why it gets the blame. A goldenrod infused honey is a popular remedy for sore, scratchy throats that often plague allergy-sufferers. Goldenrod is also known to be a tonic for the urinary tract. It supports kidney function and increases urinary output without depleting electrolytes. In UTI cases with burning and urgency, it is anti-inflammatory and antispasmodic to the smooth muscle of the ureters, bladder, and urethra. 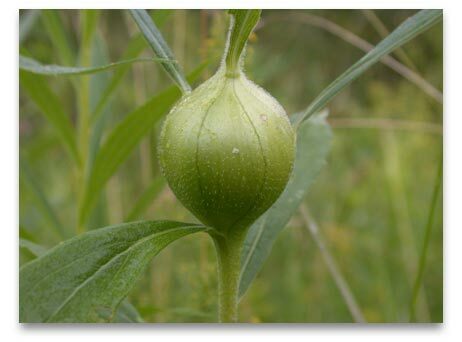 It is also been used as an antilithic to prevent and treat kidney and bladder stones. 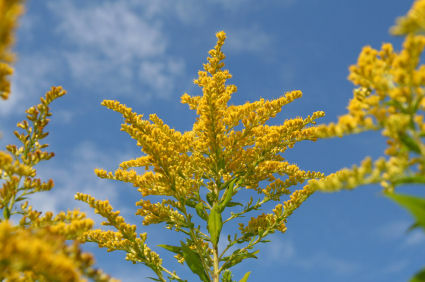 The German Commission E recognizes goldenrod today as “irrigation therapy for inflammatory diseases of the lower urinary tract” and for the treatment and “prophylaxis of urinary calculi and kidney gravel”, and also for treating yeast infections. Because of its affinity to the kidneys, use of this herb is indicated in cases of edema in the lower legs to help rid the body of its excess fluid. Goldenrod is considered to be the arnica of the east for its ability to treat tired, sore or overworked muscles in a poultice, salve, or liniment. 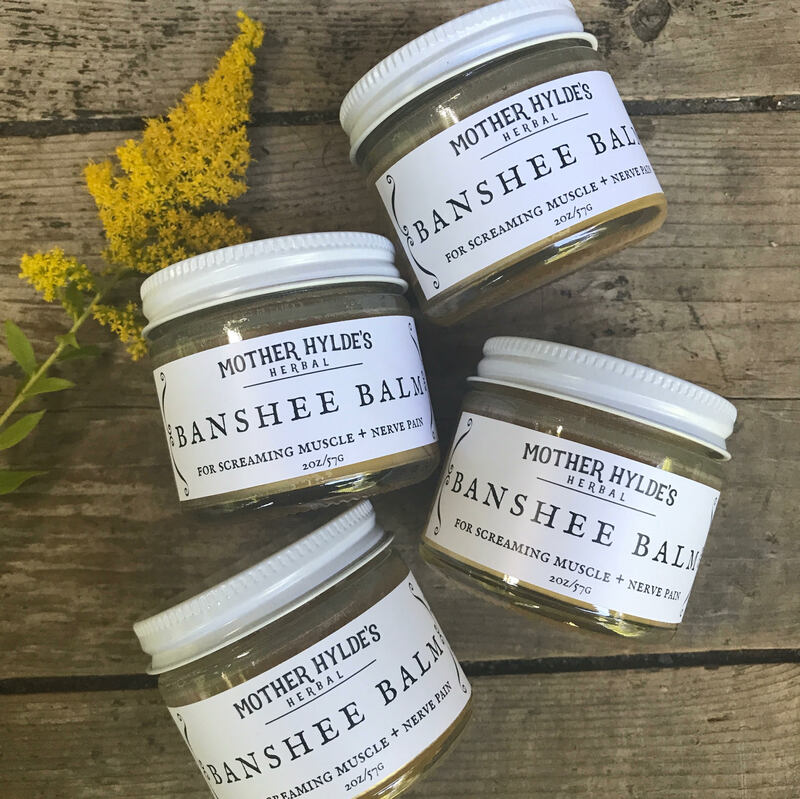 I like to combine it with kava, St. John’s wort, and cayenne for a sore muscle salve I call Banshee Balm (recipe below). Goldenrod tea is used as a carminative to treat gas and bloating in adults and is safe enough to treat colicky babies. Its bitter compounds stimulate the release of digestive enzymes and improve stagnant digestion overall. I use it as the bitter base herb in my Spiced Apple Bitters along with chai herbs which are warming and aromatic, adding carminative properties to the blend (see recipe below). Kiva Rose likes goldenrod in combination with rose and ginger for cases of SAD and mild depression with digestive stagnation. It’s not hard to see how this sunny plant can lift one’s spirits. When I took a moment to taste the leaf and pay attention to how my body reacted, I noticed a lightening feeling behind my solar plexus and clearer thinking. For the next several minutes, I had a feeling of going through life’s motions with the grace and ease of the flower heads nodding and bending gently in the wind. I was reminded that part of the plant’s success is its ability to thrive in community and form a dense, interwoven, sprawling foundation in its root system. It reminded me of the importance of having a strong central stalk, but still be able to remain flexible with its interactions above ground. Goldenrod also reminded me how to link together and stand in solidarity with one another; even when some of us carry scars from the things that go unseen. Good, complete research involving human subjects is difficult to find supporting the traditional and clinical uses of Solidago canadensis. Small animal studies have been done to demonstrate its anti-inflammatory as well as its antispasmodic and diuretic effects, using the S. chilensis and S. gigantea species. In vitro studies also confirm the antioxidant action of S. virgaurea. A small, randomized, double-blind trial using 40 participants was conducted using extracts of goldenrod and ginger to control the symptoms of the common cold. Even though half of the original 80 volunteers dropped out, the results of this small study concluded that the extract was superior to that of echinacea in relieving cold symptoms over the first seven days. S. microglossa, a native of Brazil, called “arnica-do-Brasil”, is used in Brazilian folk medicine as an astringent, wound healing herb for stomach disorders, bruises, and acne. The results of this in vitro and in vivo study (using mice) concluded that an ethanol extract of S. microglossa demonstrated antioxidant and hepatoprotective qualities. In a review of herbs for the urinary tract, a double-blind, randomized clinical trial was cited using goldenrod to increase urine output and treat cystitis in pregnant women with positive results. Unfortunately, the study was only reported at a conference and has not been published yet in a peer-reviewed journal. S. virgaurea has also shown to have a cytotoxic effect on prostatic tumor cells in mice, making it a potential addition to treatment protocols for prostate cancer. As a tincture: 1:2, 95%, 3-5ml, 3x/day- UTI, inability to void, frequent urination, seasonal or cat allergies. As a tea: 1/2oz dry herb in 1 qt boiling water, steeped 30 mins covered, taken hot to induce sweating, or as a cold infusion to relieve gas or colic. In a honey: fill a jar with fresh herb and cover with honey, gently warm in double boiler for a few hours to overnight. In oil: 1:5, freshly dried herb in olive or grapeseed oil or made into a salve for sore, overworked, or muscles in spasm. Goldenrod is considered a generally safe herb (GRAS). Since the leaves are a natural source of latex, persons with a latex allergy should take caution handling the herb. Also, it shouldn’t be taken in conjunction with diuretic medications, because the body may lose too much water, depleting electrolytes. Flavonoids (kaempferol, rhamnetin, quercetin, quercitrin, astragalin, afzetin), saponins, volatile oils, germacrene, pinene, limonene, hydroxycinnamic acid, caffeic acid, and tannins. Melt all ingredients in double boiler and fill salve jars. Fills four 2oz salve jars. Rub this “solid massage oil” on sore, tired, overworked muscles that are screaming out for relief. Also useful for pain associated with sciatica. Not for use on broken or abraded skin. I can’t stock this item in my Etsy shop, because it has kava in it and they are weird about kava, so you have to email me directly to order this. Cover in goldenrod tincture. Alternatively, you can fill the jar the rest of the way with fresh flowering tops of goldenrod. I just happened to have a half gallon of goldenrod tincture on hand. If you don’t have goldenrod tincture, cover the herbs with vodka or brandy until it’s about 3/4 full. Add a glug or two of maple syrup. Cap tightly and date and label the jar. Macerate for at least a month, shaking ever day, or as often as you think of it (let’s be realistic, here). Take 3-5 drops before meals for digestive support. I have also used this remedy for fall allergies. Goldenrod is specific for that, and the chai spices help to warm up and dry out cold, boggy sinuses. 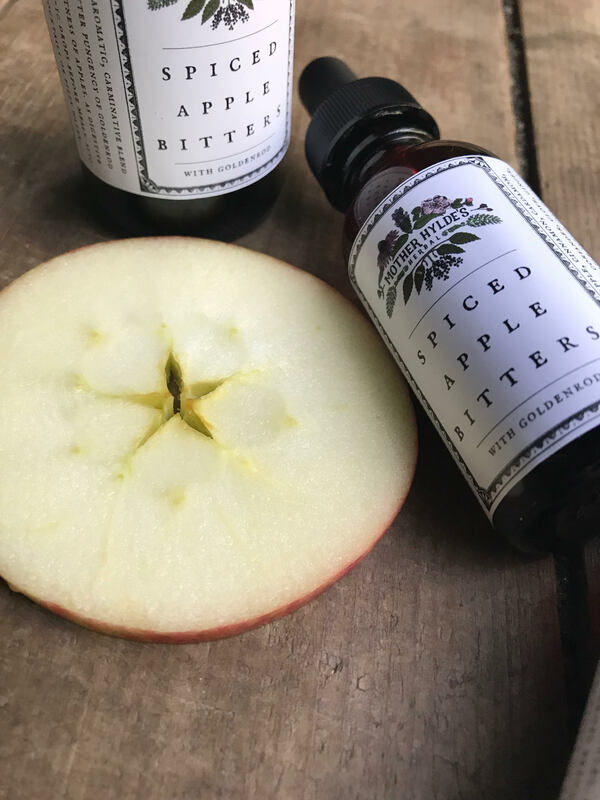 You can purchase my Spiced Apple Bitters in my apothecary. I wrote this monograph while on vacation with my family in the Adirondacks (about 40 of us). I was sitting in my cabin with a piece of goldenrod that I had trimmed from a stand down by the lake, working on this paper. I was researching its wound healing capabilities when my 9-year-old niece took a spill on the gravel outside. She had a scrape on her knee, and half of her big toenail was pulled back from the fall. Someone called for me to bring my first aid bag, and after addressing the knee wound, I decided that she needed a foot soak for her injured toe. 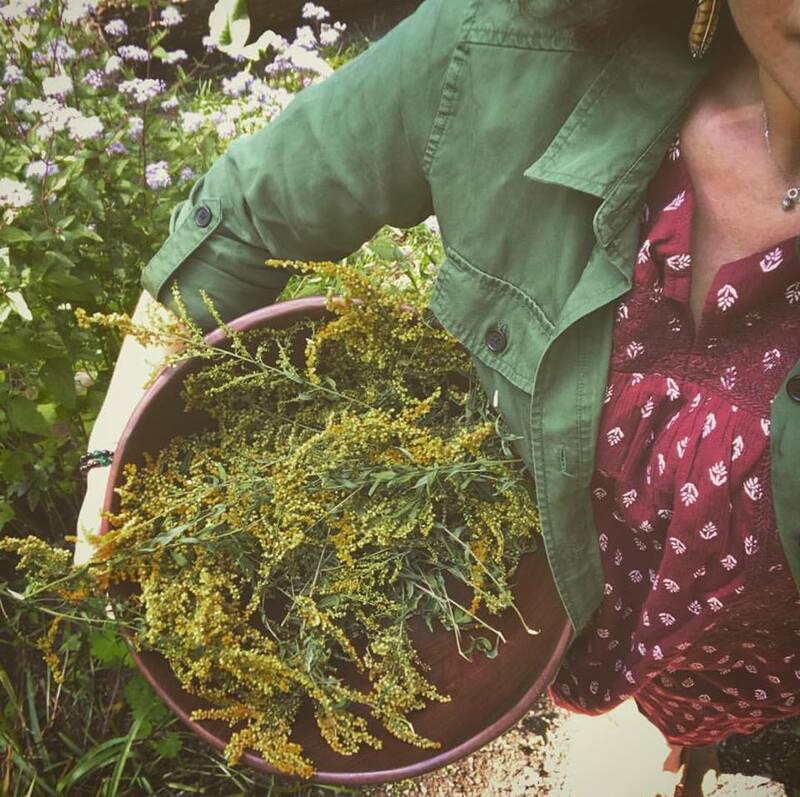 I carry dried yarrow in my bag, and boiled water to make tea for a foot soak. I was trying to think of what else I could put in it when I saw the green leafy stalk of goldenrod I had been using as a study aid. Into the pot it went. When it was cool enough, she soaked her foot and cleaned the wound with the tea in a small irrigation syringe. So many times I’ve been in need of a remedy, and a plant that has been occupying my thoughts comes forward and says “Hey, it’s me! I’m the one you need! I’ve been teaching you how to use me!” I can’t help but think the plants know just when to show up.